As the ALPSP Conference approaches (it's just under two weeks away and booking closes today) we are delighted to present the final post in the series that shines a spotlight on the finalists for the ALPSP Awards for Innovation in Publishing. 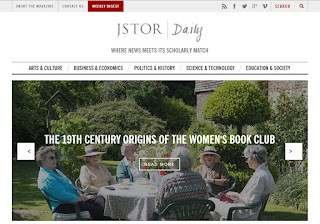 Catherine Halley, Editor of JSTOR Daily, tells us what it's all about. JSTOR is part of ITHAKA. ITHAKA (www.ithaka.org) is a not-for-profit organization that helps the academic community use digital technologies to preserve the scholarly record and to advance research and teaching in sustainable ways. We provide innovative services that benefit higher education, including Ithaka S+R, JSTOR, and Portico. JSTOR is a digital library of more than 2,000 academic journals, dating back to the first volume ever published, along with thousands of monographs, and other material. JSTOR Daily is an online magazine published by JSTOR that offers a fresh way for people to understand and contextualize their world. We make historical peer-reviewed scholarly research and other library content relevant and accessible to a general audience by connecting it to the news and offering open access to the original research and other content housed in the JSTOR library. Our cheeky tagline—“where news meets its scholarly match”—encapsulates our belief that deep, substantive journalism doesn’t have to be boring. In addition to weekly feature articles, the magazine publishes daily blog posts that provide the backstory to complex issues of the day in a variety of subject areas, interviews with and profiles of scholars and their work, and much more. exposes the work of scholars who are using JSTOR to conduct their research. We’re an extremely small team, a micro team, really. The site has two full-time editors and two part-time contributing editors. The stories are written by freelancer writers who are paid for the content they produce. We sit in the marketing and communications department at JSTOR, and work with a part-time in-house marketing person as well as a designer. JSTOR Daily publishes high-quality, carefully researched content that provides an alternative to the listicles and clickbait that seem to dominate mainstream media. JSTOR is home to some of the most fascinating and well-respected peer-reviewed scholarship, as well as thousands of historical documents. In fact, the sheer volume of information available in the library can be so overwhelming that much of the content remains hidden in the archive. By weaving stories around the research, primary source material, and other content in JSTOR, and relating it to current conversations in the public sphere, JSTOR Daily aspires to expose the breadth of this truly great library to a wider audience, and encourage a general reader, regardless of institutional affiliation, to discover and dive into it. The magazine appeals to the knowledge seeker and lifelong learner in each of us. While the website publishes editorial content, rather than peer-reviewed scholarship, we hope the magazine stories will transform JSTOR from a passive repository of knowledge to an active participant—in partnership with our readers and authors—in the generation and dissemination of collective human wisdom. 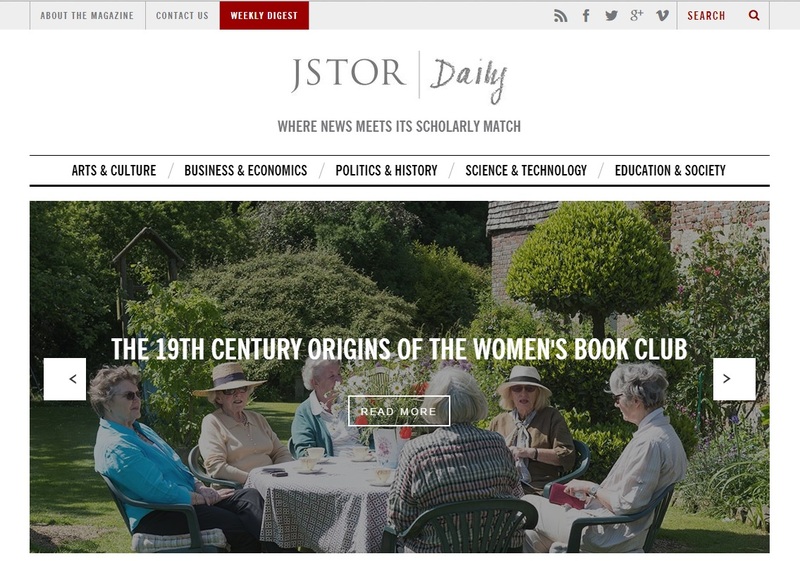 JSTOR Daily was launched in October 2014 on a shoestring budget with just one editor. In keeping with JSTOR's commitment to testing what software developers call "minimum viable products," the site was built using an out-of-the-box WordPress theme called SimpleMag. While the live site is more technically efficient than innovative, we have long-term plans to add interactive content, data visualizations, and a podcast series in the coming year. 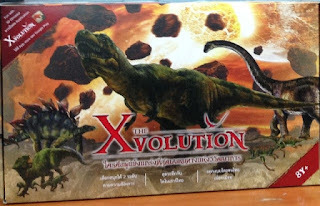 The Xvolution is the first Thai commercial board game specifically created based on Thai fossilized specimens data through the ally of public and private sectors. It has been developed by the NSTDA (National Science and Technology Development Agency) Thailand, partly supported by Plan Toys (Plan Creations Co., Ltd.) and G Softbiz Co., Ltd. In this latest post from the finalists for the ALPSP Awards for Innovation in Publishing, the Xvolution team explain what it is and how it works. The National Science and Technology Development Agency (NSTDA) is an agency of the government under the Thai Ministry of Science and Technology. NSTDA is an umbrella organization that plans and executes the four mandated missions of research and development, technology transfer, human resources development and infrastructure development. NSTDA comprises four national research centers: BIOTEC (National Center for Genetic Engineering and Biotechnology), NECTEC (National Electronics and Computer Technology Center), MTEC (National Metal and Materials Technology Center), and NANOTEC (National Nanotechnology Center). NSTDA works closely with its partners from other government agencies and the private sector, both domestically and internationally, through different mechanisms to achieve these goals. The Xvolution is an edutainment board game, partly based on Thai paleontological specimens data. All illustrations are supervised by experts in the field. Augmented Reality (AR) technology and the matched mobile application are an accompaniment to the game. Three stakeholders were involved in game development: the prototype was initiated by researchers, the AR and commercialized version improvement were supported by private companies. The Xvolution is the first Thai commercial board game, providing a new business model for Thai gamers. The game contents were also modified to be used in subway exhibition and also at the Thailand Science and Technology Fair. The board game is both a recreational and educational tool. Recently, board game playing has gained popularity among Thai teens and adults, especially in urban areas. But up to now all the commercial games have been imported from abroad. It is hoped that making a prototype game might be a good way to stimulate many gamers to start creating new games themselves. The Xvolution was initiated by a Ph.D. student, Mr. Peechanit Ketsuwan, and two NSTDA (National Science and Technology Development Agency) officers, Ms. Sasithorn Teth-uthapak and Dr. Namchai Chewawiwat. The game design is based on the main idea that most of people, of any age, may enjoy playing the game, and the activity itself is a very effective way for learning. We focused on the basic evolutionary contents that were also supplemented with unique data from Thai fossilized specimens. All drawings were newly created for this project. Dr. Varavudh Suteethorn and Dr. Suravech Suteethorn supervised the accuracy of all the illustrations in the game. Both are the researchers at the Palaeotological Research and Education Centre, Mahasarakham University. Dr. Varavudh is now the Director of the Centre. The rules for Xvolution are modified from the standard Millionaire Game. But instead of using fixed-squared big board, we designed small hexagon-shaped steps that all the players could select to combine and use as the route. Some special command signs are added for the Battle, Mutation and Level Up. All of these either use for biological contents adding or game excitement enhancement. When the player steps on the sign 'Battle', (s)he need to 'Battle' with another player, using specific cards obtained from the start and during the playing. The 'Battle' card shows the special environmental condition, ie. endemic, hot and draught, etc., and the player need to choose their cards to fight, with the opponent player. So, for example, if the ice age is the condition, then the animal with fur will survive better than the animals with thick and thin skin, respectively. About a dozen of environmental change conditions is included, to demonstrate the interaction between animals and physical/ biological surroundings. The 'Mutation' sign is for the mutation concept learning. The player who steps on this sign will open the 'Mutation' card which will command some actions. This might be to exchange genetic materials: exchange your 'Skin' card with central pool. The most severe mutation condition is extinction! Every time the player passes the 'Start' point, (s)he will gain some eggs and could use them to exchange to the upper level of evolution. The winner is the one who passes from the oldest to the most recent geological era first or who could gain more cards and eggs in the players' set-up period of time. The game prototype was tested several times using different group of players, varying from elementary, secondary school and college students and also adults, from lay people to researchers. Most of players were satisfied and had fun with it. AR Technology is presently merged into several products, including books. G. Softbiz Co., Ltd. and several other Thai publishers were successful in using AR technology to promote fairy tale books. Taking photographs with some dinosaur models is a very attractive idea and has the potential to make young children pay more attention to this game and the palaeontological contents. G. Softbiz Co., Ltd. developed the dinosaur models for AR and the mobile app. The Xvolution is available for free download. A specific business model was used for the Xvolution. NSTDA absorbed all the expenses on the prototype development and also partly in final production. Plan Toys, the local expert company in children's toys and books, helped transform the prototype to the commercial version. Some material and resins were changed to be wood and paper works. A lighter and more compact box set was modified. Plan Toys also shared some expenses on production. G. Softbiz Co., Ltd., another local companies that is expert on AR design and book publishing, helped develop the AR model and mobile application and invested in this part. The revenue is shared within these three stakeholders. After more than five years of development, the Xvolution board game launched in January 2015 at Isetan Department Store, the Bangkok Central World in the downtown area of Bangkok. The opportunity to export the Xvolution abroad is now being considered. The social media of this game is at https://www.facebook.com/TheXvolution. From the start, the monetary profit is not the major reason or target for our innovation, but the science communication to the public, including the distribution of the scientific information, and the application of a new way for public understanding of science are our concerns. Therefore we used our information and/or products in many other ways too. 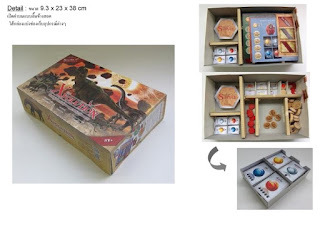 The game has been simplified and used as a part in the Thailand Science and Technology Fair 2012. This Fair normally runs for two weeks with more than 1 million visitors, mostly students. We also did the Xvolution mini-exhibition at Chatuchak station of Thailand underground train during July to December 2013. Several ten thousands people transit through this station daily. We also tried to push the Xvolution contents to be applied as a TV game show on the Thai PBS TV station. The concept of program was discussed several times and the air-time was granted but, unfortunately, we could not find sponsors for this program. We aim to distribute the simple blue-print of the game as a free download for students and teachers, to use as a study tool in schools, in the future. In this latest post from the finalists for the ALPSP Awards for Innovation in Publishing, Susan Spilka, Marketing and Communications Director for CHORUS, tells us more about the project and why they felt it should be entered for the Awards. "It’s an honor for CHORUS to be included among the impressive group of finalists for the ALPSP Awards for Innovation in Publishing 2015. We greatly appreciate the opportunity to showcase the work we are doing. CHORUS is the outcome of successful collaboration since 2013 among publishers, funding agencies, scholarly societies, and other stakeholders. Our services and best practices provide a sustainable, scalable, cost-effective, interoperable, and transparent solution to deliver public access to published articles reporting on funded research. As a not-for-profit 501(c)(3) membership organization, CHORUS is policy-neutral and focuses on building consensus and services to advance public access in a way that recognizes and sustains the value that publishers bring to science and scholarship, for the benefit of all. The result is increased discoverability for authors’ research, enhanced accountability for funders, and accessibility to articles reporting on research, for everyone. CHORUS is being adopted by funders to enhance their efforts to increase public access to articles based on funded research and complement their compliance procedures. CHORUS launched with a commitment from the US Department of Energy (followed by a Participation Agreement in April 2015). This week, the Smithsonian Institute released its Public Access plan, naming CHORUS as part of its solution. We expect to announce a pilot project with another federal agency very soon, and anticipate more agency agreements by early fall. CHORUS has also started discussions with a number of funders outside of the US as well as several global NGOs that fund research. CHORUS is growing rapidly, gaining momentum as we add publisher members’ content and enter into partnerships with funders. As of early August 2015, we are monitoring over 120,000 articles associated with 24 funders for public access, with more than 30,000 already publicly accessible. Our membership roster includes publishers of all stripes and sizes (including not-for-profit societies, university presses, and commercial companies with pure OA and hybrid programs) as well as publishing service providers and organizations. Members pay modest fees to support CHORUS’ operations, while funders, researchers, university research officers, librarians, publishers and the public all benefit from CHORUS’ services at no cost. Our small staff includes myself and Howard Ratner (Executive Director) – two publishing veterans bringing multiple decades of experience – along with a Digital Analyst, Program Manager, and outsourced development, legal, and finance staff. We rely heavily on the tireless efforts of a volunteer Board of Directors and working groups. CHORUS knits together new services and open APIs with the existing scholarly communications infrastructure to minimize effort and expense and maximize the identification, discovery, access, and preservation steps of compliance to funder public-access requirements. CHORUS utilizes CrossRef’s FundRef service to identify and keep track of papers reporting on research coming from funder grants and contracts. We promote the use of ORCID identifiers and other industry best practices. The resulting metadata (including the DOIs of the published articles) helps make articles more easily discoverable (via CHORUS’ Search service as well as agency portals and general search engines) and transparently describes their public accessibility. 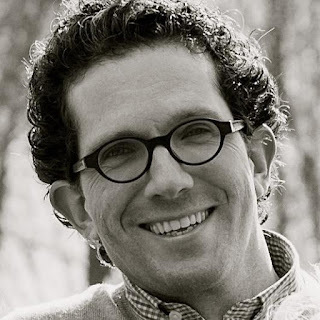 Part of what makes CHORUS unique is that our distributed access approach points users directly to the best available version of articles (either the accepted author manuscript or Version of Record) on publishers’ sites, either immediately or after the prescribed embargo period, in perpetuity. 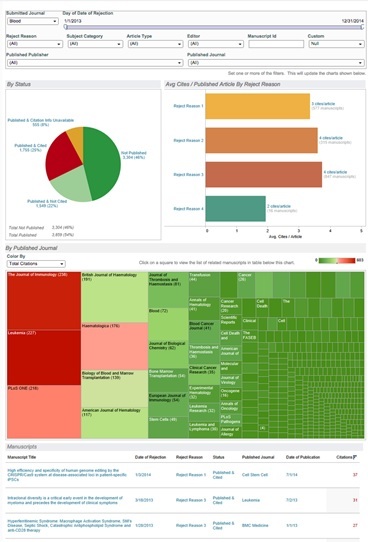 CHORUS also provides freely available, downloadable dashboards with detailed reporting on public accessibility and availability of reuse license terms and preservation arrangements. Our auditing system – a hybrid system of automation and manual checking for public access – follows the DOI links for every identified article in our database. CHORUS publisher members are required to archive their content; CHORUS has special arrangements with CLOCKSS or Portico that enable perpetual public accessibility. CHORUS is committed to evolving with the needs of the scholarly community. Recently we started to provide customized publisher dashboards as a member benefit. We’ll soon be making our open APIs widely available. Further down the pipeline we are considering some projects designed to make publicly accessible content and data more discoverable. Our recent agreement with ORCID formalizes the coordination of our efforts to promote the adoption of identifiers and standards to manage access to and reporting of research outputs. We also see the tremendous potential of providing access to data; as a result, we are participating in such Initiatives as CrossRef/DataCite, RDA/WDS-Publishing Data Services Working Group, and RMAP. Stay tuned for new developments … it’s going to be a busy fall! Follow CHORUS on Twitter @CHORUSaccess and Linked In." 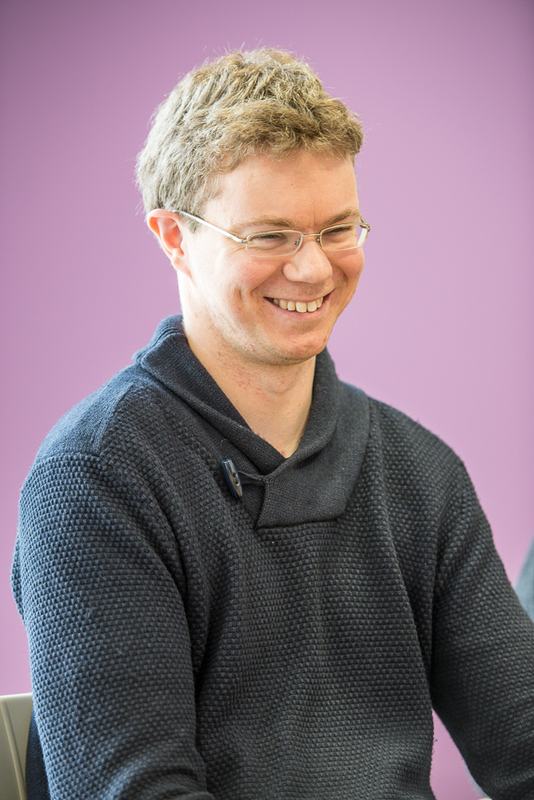 In the fifth of the ALPSP Awards for Innovation in Publishing finalists' posts Martijn Roelandse Springer's Manager for Publishing Innovation and Euan Adie, Founder of Altmetric and fellow co-developer of Bookmetrix, talk about how they worked to launch the product. Tell us a bit about both companies and how this collaboration came about. As a large publisher of STM content, with a current catalogue of over 194,000 books, Springer is always keen to offer further services for our authors and editors - in particular in relation to the insight into the attention, use and impact of their titles. 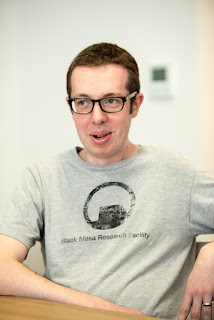 Altmetric are a data science company based in London. Founded in 2011, Altmetric made it their mission to track and analyse the online activity around scholarly literature, and today supply data via their distinctive ‘donut’ badges and platforms to many of the world’s leading publishers, funders and institutions. The idea for this project was originally conceived at Springer, who wanted to find new ways to offer added value and additional feedback to the authors and readers of their extensive book content. In addition, Springer also wanted to offer their editorial and marketing teams an easier way of tracking the reach and impact of their publishing portfolio, and were keen to offer further insight than download and citation counts alone would be able to provide. Having first established a relationship Altmetric in 2011 with the adoption of the Altmetric API for all of their journal articles, Springer were familiar with the Altmetric team and felt there would be a shared approach and understanding of what the project was trying to achieve. 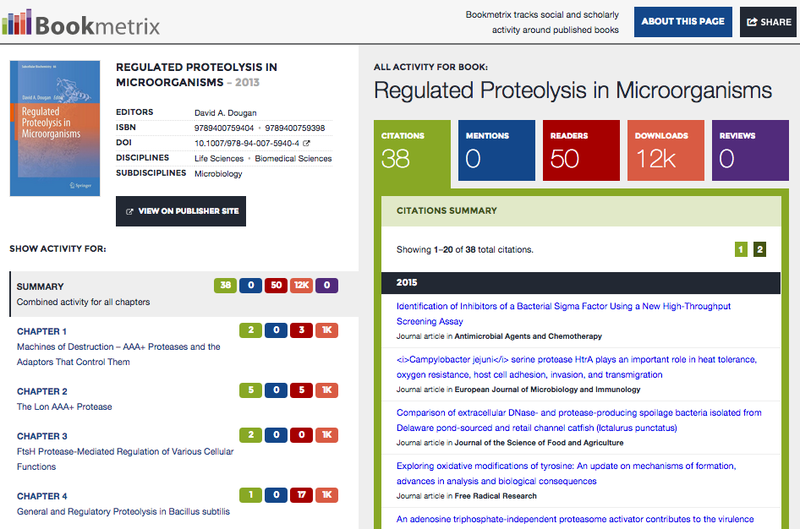 We submitted Bookmetrix - the first platform of its kind to help authors, editors, publishers and readers to track the broader impacts of a book or chapter once it’s published. 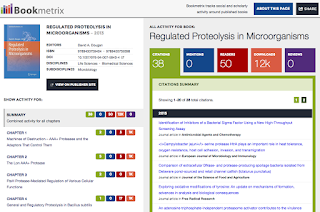 The project encompassed two parts; public-facing details pages, which are now accessible via the metrics displayed on every SpringerLink book page, and the Bookmetrix search interface - a database which Springer staff can use to browse and filter the metrics across their book portfolio. Bookmetrix was built as a partnership between Altmetric and Springer - regular meetings between the two groups (comprising project leaders, product managers, and developers) ensured that we agreed goals and concept early on. The aim was to offer authors and readers a totally new way to see and understand the impact of their work and to help set a new standard for monitoring and reporting the activity surrounding a book post publication. To achieve this, we worked to pull in mentions and other online activity relating to each book or chapter from a variety of different sources - including downloads, citations, book reviews, public policy, mainstream media coverage and social media shares. The data was then surfaced via the details pages - where users can see a summary of the mentions of the whole book, and dig down to view the mentions for each chapter and the original comments from each source. 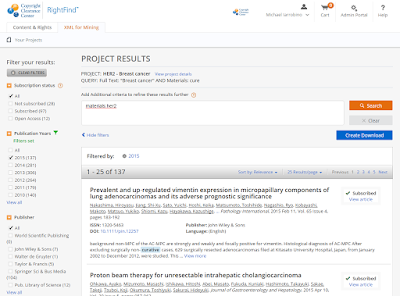 The details pages can be accessed via the SpringerLink platform and via the search interface (by Springer staff). Bookmetrix is the first platform of it’s kind to bring together such a valuable mixture of traditional and non-traditional indicators of broader impact and influence for books and individual chapters. Such measures are increasingly important for authors who are asked by funders or institutional management to demonstrate the influence of their work - and are particularly valuable for those who do not chose to publish journal articles (which often bring the most credit) as their main form of research output. As well as offering this additional insight, Bookmetrix has demonstrated the value that can be found in publishers combining their objectives with the technical and domain expertise of an external partner. The scope of Bookmetrix is wider than existing initiatives in the market: it covers substantially more books and goes beyond pure citation data. Bookmetrix fits in Springer’s ambition to drive more industry-wide initiatives to support the work of authors and researchers. John Hammersley, Founder and CEO at Overleaf (Writelatex Limited), in the fourth of ALPSP Awards for Innovation in Publishing finalists' posts, explains what the collaborative writing and publishing platform is about and how it works. Founded in 2012, by me, John Hammersley and my friend and colleague, John Lees-Miller, Overleaf is an academic authorship tool that, in essence, allows researchers to spend more time saving the world by making it much easier for them to write and publish their work. How do we help? Overleaf is an easy-to-use, intuitive editor that enables efficient collaboration and effortless manuscript submission on all types of research articles. So you spend less time worrying about formatting and versions, and more time doing your research. We've seen amazing growth since we started, with over 250,000 registered users in just over 2 years – and this is something we originally built simply for our research group. We have been growing rapidly since our launch, mainly through the grassroots movement that has formed around the platform – Overleaf users are incredible. We always say we have the best users on the planet, especially given our recent milestone! 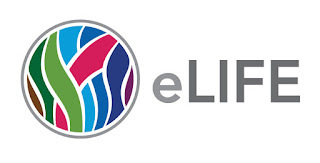 Overleaf submitted our cloud-based, academic authorship platform for the ALPSP awards. By providing an intuitive online collaborative writing and publishing platform, Overleaf is making the process of writing, editing and publishing scientific documents quicker and easier. Researchers and academics can now write, collaborate, and publish with a single click, directly from the Overleaf web-app. Publishers and Institutions are partnering with Overleaf to provide customized writing templates, simple reference tool linking, and one-click publishing submission links. Overleaf brings the scientific documentation process into a Google-docs like environment, developed to seamlessly connect the academic and publishing workflows from writing-to-review-to-publication. Overleaf’s free service allows the entire scientific documentation process to move into the cloud – from idea to writing to review to publication. Users can collaboratively view and edit documents in either a simple word processing interface or as native LaTeX source code – from anywhere. Users can choose from multiple template options, including customized book or journal templates, which can be publisher specific. All the required components – such as chapters, sections, title pages, glossaries, references and acknowledgements – are pre-defined and ready to be populated. Authors simply open the template and start writing, safe in the knowledge that the output conforms to the editorial guidelines of their target journal or publisher. Automatic formatting significantly reduces editorial costs and reduces time to publication. As a user types or makes changes, the environment provides an automatic preview of the fully typeset document – allowing everyone to see exactly what the finished document will look like. Authors can link their preferred reference management tool directly to their Overleaf account – allowing fast, simple and correct in-document referencing and citation without worrying about editorial guidelines. Once the document or project is complete, there are multiple output options. Authors can submit directly to a publisher, journal or repository from within the Overleaf platform, through a simple one-click submission button, or output the file in cross-platform LaTeX or PDF formats. Overleaf greatly reduces editorial and review turnaround times with powerful change tracking, commenting and project lifecycle management features. Publishers can quickly and easily make notes or edit a document, share those changes with other editors, peer reviewers or authors and move through the editorial and peer review process quickly and easily. No more emailing papers back and forth and manually marking up changes. Overleaf has also been a beneficial service for publishers and societies who are looking to simplify the LaTeX writing and submission process for their users, or to provide a powerful, value-add tool for their authors. Overleaf makes the scientific writing, review and publishing process simple – for everyone. The new word-processing environment, allows non-LaTeX users and journals to experience the same advantages of seamless collaboration, easy templating and one-click submission. As for the team behind it… Overleaf is really the brainchild of my colleague, John Lees-Miller – who, while we were doing research on driverless cars and publishing papers with the Bristol University Engineering Mathematics group, saw a need for a collaborative scientific writing tool, and he built one! In the past, LaTeX, the scientific writing language required for many hard sciences, was only available as a single-user desktop writing application. As an open source application with a number of commercial distributions, LaTeX suffered from fragmentation, resulting in a lack of interoperability, undermining its cross-platform origins. In other words, the hundreds of LaTeX desktop writing application options only added to the difficulties in collaborative scientific research and writing. Researchers would usually find that collaborators used a slightly different distribution - meaning that their documents could not be read. With no good way to collaborate on individual files – authors would compile and output large typeset files, and email or FTP the read-only output back and forth. Obviously, the process was far from ideal. Thus, the idea for Overleaf was born! Our answer was to build a cloud-based scientific writing and collaboration tool for LaTeX documents which we called ‘WriteLaTeX’. As a cloud-based web app, WriteLaTeX did not require authors to download or install any software and allowed co-authors to collaborate in LaTeX in real time for the first time. Think Google Docs – but for complex scientific papers and formulas! As colleagues learned of this new, easy-to-use tool, word spread and WriteLaTeX grew. Soon we found ourselves dedicating more and more time to developing and growing this popular new scientific service – leading to what is now our London-based start up: Overleaf. 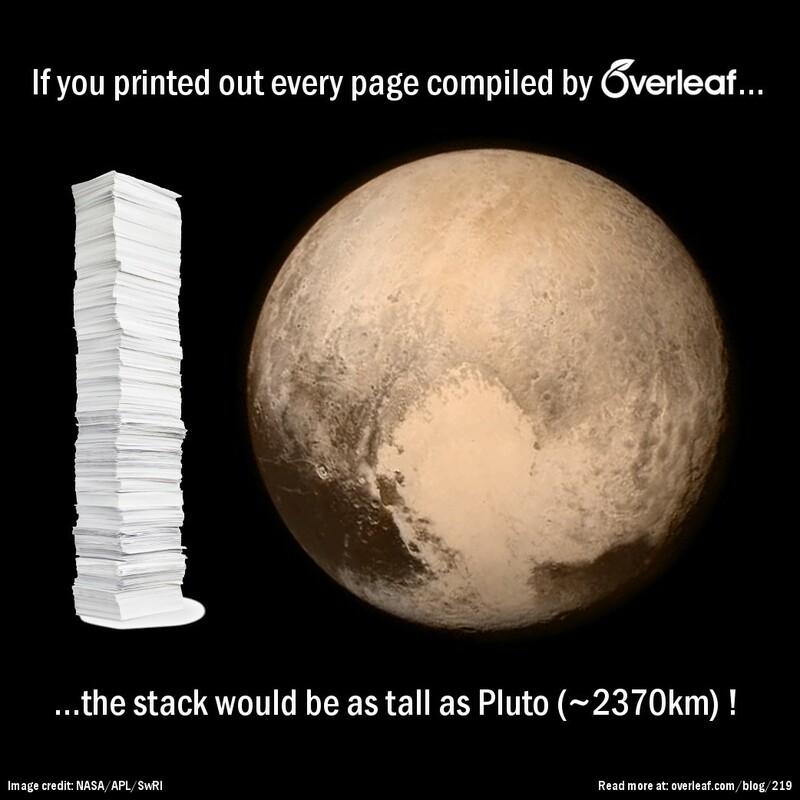 Overleaf has had a phenomenal first two years, with close to 250,000 registered users from 180 countries worldwide who have created in excess of three million documents from over 2,000 publishers, institutions and universities across the globe. Researchers love the innovative and easy-to-use writing and collaboration web app, and publishers love the cost savings from receiving perfectly formatted submissions first time, the groundbreaking online editing tools, automated typesetting and pagination, and clean outputs. This is a new tool for the scientific community that was previously unavailable – something needed and wanted by researchers across the globe and a clear win-win for authors and publishers. It is a great fit for the ALPSP Award as it provides a crucial digital tool for scientists - advancing the scientific writing and publishing process. 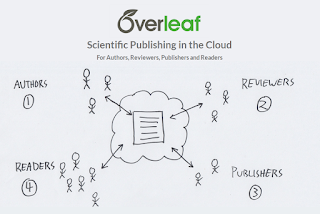 Overleaf supports scientific writing, editing and collaboration in the cloud better than anything available today. Overleaf has been focused on growing in the Publishing and Institutional space since 2015 and has already signed with more than 10 institutions – including Stanford University – and more than 10 publishing partners – including Nature Scientific Reports and PeerJ. These publishing and institutional partnerships will be fundamental in the growth of Overleaf. Overleaf is also partnering with organizations who help the researcher and academic writing and publishing workflows. Overleaf believes that these integrations are also crucial for expansion of the service. Providing users with a winning platform includes seamlessly integrating the tools and services that are needed by researchers, academics, publishers and institutions. Partnerships and integrations have been established with multiple organizations, such as: Mendeley (reference management), Aries Systems (peer review system), Figshare (data repository), Editage (Editing service), and more. Additional partnerships and integrations are being established monthly. Check us out at www.Overleaf.com and sign up for a free account. Jake Kelleher, Senior Director, Licensing and Business Development at Copyright Clearance Center (CCC) talks about RightFind™ XML for Mining, a solution which facilitates copyright-compliant access to full-text article content for text and data mining. CCC was founded over 35 years ago at the suggestion of the United States Congress to provide an efficient market for the clearing of photocopy rights. Today, CCC is a global leader in content and licensing solutions for publishers, businesses and academic institutions. Located near Boston, we have more than 380 employees dedicated to serving the needs of over 12,000 publishers and providing innovative content and rights-licensing technology solutions for more than 35,000 customers around the globe. In the mid-90s, when publishers were struggling with how to best protect copyrighted material in a new online world, they worked closely with CCC to create RightsLink®, which made it easy for visitors to a publisher’s website to purchase permissions and other services. Years later, we collaborated with our publisher customers again to use RightsLink’s advanced ecommerce capabilities to manage article processing charges (APCs) and other author fees for journal articles. 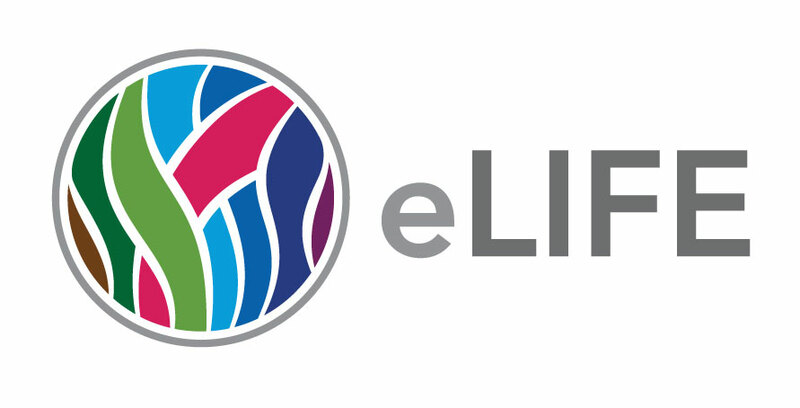 As a result, we launched our RightsLink for Open Access platform with a range of new capabilities developed with input from customers and partners. This summer, we introduced our new RightFind XML for Mining Service in partnership with six major publishers. We submitted our latest advance, RightFind XML for Mining, a great example of CCC’s culture of innovation offering new revenue opportunities for life science publishers. XML for Mining is built on the RightFind platform, CCC’s unique suite of cloud-based corporate workflow solutions that offer immediate access to a full range of STM peer-reviewed journal content. XML for Mining launches from this platform and contains normalized, full-text articles from multiple rightsholders, allowing researchers to create a corpus of articles relevant to their research. Once the corpus has been created, researchers download these articles into their text mining solutions. XML for Mining almost eliminates the weeks, or even months, of work it takes to prepare scientific content for use in text mining solutions, thus accelerating research and discovery. In fact, we recently received some very positive feedback from a leading international pharmaceutical company that they love the full-text search and can’t get it anywhere else. As always with CCC, feedback and ideas from our customers guide everything we do. We developed RightFind XML for Mining with input from text mining researchers and publishers looking for a voluntary, market-based licensing solution. And we will continue to listen to the market, add new publisher content and develop new features, and explore ways to collaborate with technology partners. RightFind XML for Mining represents a huge step forward for publishers navigating text and data mining waters. For these publishers, the solution has several key advantages. It enables end users to have access to aggregated article content from multiple rightsholders in a single service with normalized metadata, and that has never been done before. It offers a web-based, user-friendly interface, as well as a RESTful Application Programming Interface (API), so that researchers can easily identify and download, in full-text XML format, relevant articles for mining within their workflow. It also reduces the necessity for time-consuming one-off licensing negotiations with publishers, along with the associated costs to administer, format and deliver custom content feeds to individual customers. Moreover, our robust API enables integration with leading text and data mining software platforms. Thus, publishers gain a new channel for their content along with valuable usage data, while users can reduce the number of operational steps involved with finding a needle in the haystack. ALPSP: What are your plans for the future? We create content workflow and licensing solutions that make copyright work for everyone. That means identifying and reducing pain points for publishers and their customers. RightFind XML for Mining reaffirms CCC’s role as an independent intermediary between content providers and users that can identify inefficiencies and create bridges between the two groups. As publisher and market needs evolve, we will evolve our services, as well. 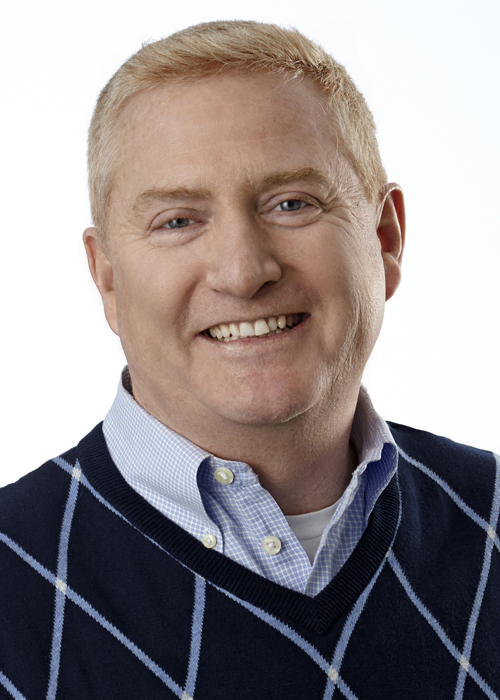 Jake Kelleher is Senior Director, Licensing and Business Development at Copyright Clearance Center. 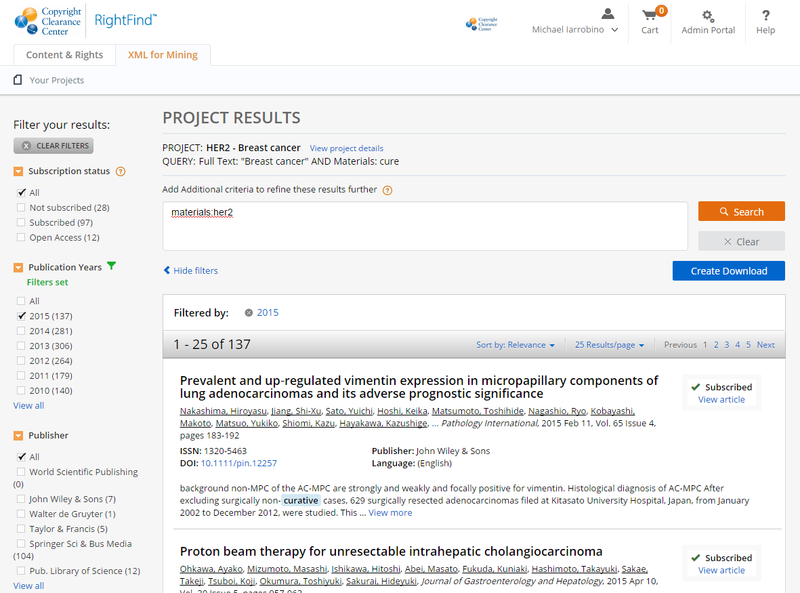 RightFind™ XML for Mining – Copyright Clearance Center’s text mining solution lets life sciences researchers move to a deeper level of discovery– beyond abstracts to direct access to full-text articles in XML format. XML for Mining saves time usually spent acquiring, licensing, and converting articles from individual publishers. Now, researchers can identify and download article collections from multiple publishers through a single, normalized source that is copyright-compliant.